The flowers and other ornamental plants that we offer at the Spring Garden Market have been trialed at our research gardens to select varieties that perform particularly well in our climate, with an eye towards ones that are beautiful and long lasting in flower arrangements. 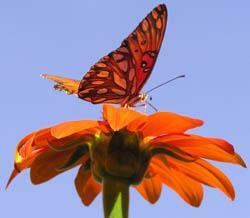 We offer an especially large array of short to tall sunflowers and magnificent zinnias. Asclepias, Showy Milkweed Asclepias sp. Tall spires of green 'bells' are dramatic in the garden and in arrangements. Annual, full/part sun, 24–30"
Feathery golden yellow plumes on tall stems. Beautiful fresh or dried. Annual, full sun, 25–30"
Small button-like flowers in vibrant shades of orange, carmine, and cherry. Annual, full sun, 24–30"
Stalks of wheat with white kernels and dramatic long black awns. Great fresh or dried. 24–36" tall. Annual, full sun, 24–36"
Wonderful for flower arranging. Furry lime-green flowers dry to tan. Grow in ground or containers. May reseed. Annual, full/part sun, 10–20"
Elegant ornamental grass. Rich burgundy seed sprays are beautiful in arrangements. Excellent in ground or containers. Annual, full sun, 18–24"
Ornamental grass 'Ultrecht Blue Wheat' Triticum sp. Fleuroselect Award for beauty, productivity, performance. Heat/drought tolerant. Half-hardy perennial, full sun, 24–30"
Double blooms, colors of an Indian/autumn sunset. Half-hardy perennial, full sun, 24–30"
Unusual quilled petals, bright autumn colors. Half-hardy perennial, full sun, 24–30"
Huge yellow flowers with green eyes, long blooming. Half-hardy perennial, full sun, 18–36"
Jewel-tone mix of purple, rose, and lemon yellow. Can be cut for drying. Annual, full sun, 24–30"
Pure white blooms, some with a blush of pink. Can be cut for drying. Annual, full sun, 24–30"
Uniform bloom time. Heads are packed with apricot, orange, peach and pastel red. Blooming in our gardens through this cold winter. Beautiful soft colors fresh or dried. Annual, full sun, 24–30"
Giant varieties have one thick stalk up to 14' tall topped by one huge flower head up to 14" wide. These all develop large, tasty seeds. Mid-height varieties are multi-branching with many flowers opening continually the whole season. Some are pollen-free that do not produce pollen or seeds, welcome for indoor arrangements. A classic sunflower, but only 18–24" tall, just the right height for children! One huge flower with edible seeds. Annual, full sun, 18–24"
These cute, colorful 1 1/2" pom pom flowers are a delight in the garden and vase. Held high on sturdy stems. Cutting flowers encourages more blooms. Annual, full sun, 18–24"
Scabiosa-type blooms with salmon-gold center crest and creamy pink petals. Blend of double, semi-double, and singles. Annual, full sun, 40–50"
Scabiosa-type blooms in an intense fuchsia-lilac color. Puffy center crest is surrounded by a flare of short petals. Annual, full sun, 24"